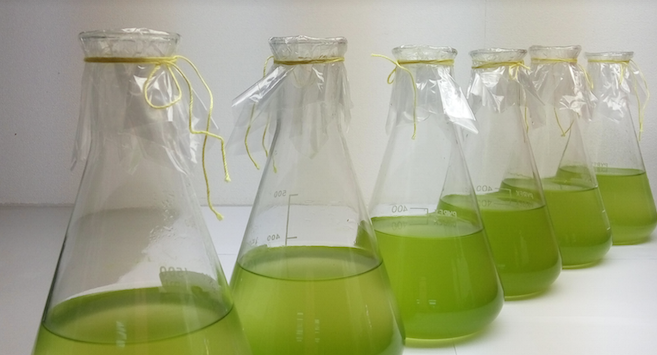 Chemical and Biomolecular Engineers from the Melbourne School of Engineering have discovered a new way to deliver carbon dioxide to microalgae, which in turn, can be harvested to make renewable fuels such as biodiesel. Carbon dioxide is well known to speed up the growth of microalgae. However, the carbon dioxide has to be free of contamination or the algae die. Published in the research journal, Energy and Environmental Science, the new method purifies the carbon dioxide that is in power station flue gases by absorbing it into a liquid. This liquid is then pumped through hollow fibre membranes. These hollow fibre membranes are like very long drinking straws, which can be immersed into the microalgae beds. Professor Sandra Kentish, Head of the Chemical Engineering Department at the University of Melbourne and leader of the research team said that supplying purified carbon dioxide by extracting it from flue gases can work, but it is expensive and takes a lot of energy. "In this work, we have found a way to purify the carbon dioxide and to supply it to the microalgae for a much more moderate cost and using a lot less energy," Professor Kentish said. "The CO2 moves directly from the liquid into the microalgae culture by permeating through the fibre walls. Aside from being a cheaper approach, our research has shown that the microalgae grow faster than in other work done to date," said another team member, Dr Greg Martin. Other products such as chemicals, proteins and nutraceuticals can also be produced using the same approach. The experiments were completed by PhD student, Qi Zheng, who is now undertaking further experiments to find the optimum liquid composition.